Najin’s father, the calligrapher Han, is very traditional. Did he fear change or was he simply stubborn? What did change represent to him? What does he gain by maintaining old customs? What does he lose? Did your perceptions of him change as the novel progressed? While Najin is the primary narrator of The Calligrapher’s Daughter, many chapters are written from the points-of-view of her father and her mother. How did seeing Najin’s world from their perspective alter your understanding of it? Najin experiences faith and belief in varying degrees. When does her faith feel strongest to her, and when does it ebb? Why do you think she is unable to sustain a consistent belief? Given her conflicted feelings about religion, did you think she made the right decision to marry a seminarian? Most of the married couples in The Calligrapher’s Daughter face severe stresses during at least one point of their relationship. Discuss the different challenges thrust upon them, as well as how they deal with them. What does this novel say about love? What does it say about fidelity? Ilsun, Najin’s brother (whom she calls Dongsaeng), often seems to bring trouble upon himself and his family. What special pressures does he face as the firstborn son? Could you empathize at all with his behaviors? Despite the Korean Confucian standard of male supremacy during that era, many of the women in The Calligrapher’s Daughter managed to find meaning and fulfillment in their lives. How did Najin’s mother, her mother-in-law and her two sisters-in-law (Unsook and Meeja) find strength to make personal choices within the confines of their roles? What opportunities did the servant women have to marshal inner resources and the ability to make choices? Najin and her mother seem to share a deep understanding of all the best qualities in a mother-daughter relationship, yet the word “love” is never spoken. What are some of those qualities and how were they conveyed? As an adult, Najin tries to keep her personal trials to herself, such as her silence about the torture she witnessed in prison. Where did her ability to suppress feelings stem from? Could she have been more expressive? When might it have served her better if she were more forthcoming with her feelings and difficulties? The estate in Gaeseong has deep significance to the family, especially to Han who has rarely left it, and Najin who has often left and returned, enabling her to recognize its significance. How is the family estate a metaphor for Korea during the Japanese occupation? Five years after this novel ends, the Korean War began. It ended three bloody years later with an armistice agreement that partitioned the nation into North and South. Considering Korea’s history of isolationism and the oppressive period depicted in The Calligrapher’s Daughter, do you think there are parallels between the Japanese occupation and the military dictatorships of Kim Il-sung and Kim Jong-il in what is now the most insular and isolated nation in the world? 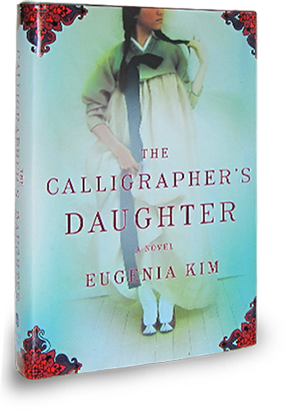 Eugenia Kim has said that her novel was inspired by the life of her mother, and that the “writing experience radically changed my regard for my mother and my father, as well as my own Korean-American identity, in the most enriching, positive way.” Are there stories in your own family’s history that might contain the seeds of a novel?